It’s been an eventful week for the iPhone. 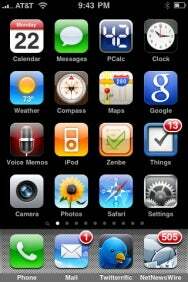 Between last week’s debut of the iPhone 3.0 software update and the Friday release of the iPhone 3GS, the entire iPhone ecosystem got a refresh. To mark the occasion, we’re using the Macworld Twitter account for some informal daily surveys about iPhone use. We’re also giving away some cool iPhone-related schwag: custom, Macworld-logo iPhone cases from various vendors. A total of 443 people responded with a list of four apps. 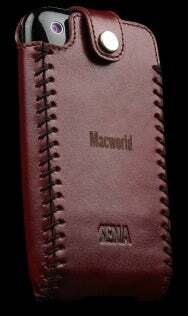 As a thank-you, we randomly picked one respondent, @chriscieri, to receive a custom-made, Macworld-logo, Sarach Leatherskin iPhone case from Sena Cases. His iPhone Dock’s residents? Daylite Touch, Mail, Messages (actually the older version, Text), and Phone. But just as fun as giving away cool stuff was going through the hundreds of messages we received. While responses on Twitter don’t constitute a scientific survey by any means, they do give us an interesting peek at the iPhone practices of Macworld’s Twitter followers. Here are some of the highlights. Those numbers mean that nearly 69 percent of respondents have replaced at least one of Apple’s stock Dock apps with something else. But which of those four apps hold their ground the best? Nearly 85 percent of respondents (375) have kept the Phone app in the Dock, and a similar number (371) use Mail enough to keep it handy. But the numbers drop considerably from there: Only 290 respondents (65.5 percent) have let Safari keep its prime position, and the poor iPod app gets Dock love from only 241 people (54.4 percent). It’s also worth noting that a few people who responded to our question are iPod touch users—11 have the touch’s Music app in the Dock, and four have the Videos app there. Given that this was a Twitter “poll,” it’s not surprising that many respondents want quick access to their favorite Twitter app. 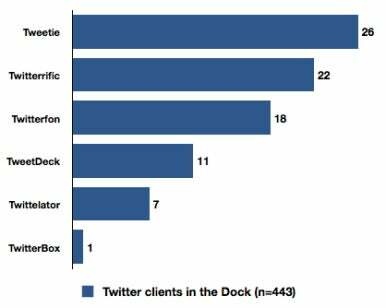 Indeed, 85 people (19.2 percent) have a Twitter client in their Dock. Which client? Tweetie and Twitterrific (free or Premium) are the most popular, but Twitterfon (free or Pro) isn't far behind. Besides Twitter clients, which third-party apps are encroaching on Apple’s Dock space? 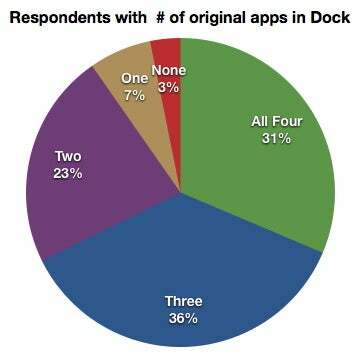 Not surprisingly, given the 50,000-odd apps available, there are few dominant third-party Dock denizens. The most popular are Things (16 respondents), FaceBook (12), Google Mobile (6), OmniFocus (6), and NetNewsWire (5). 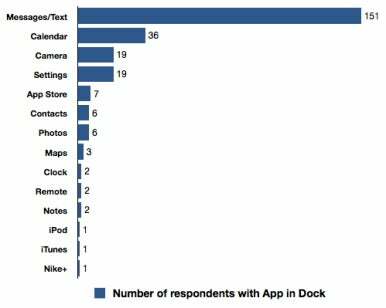 Sixteen other apps appear on fewer than five but more than one of our respondents’ Docks; fifty-nine other apps get a spot on the Dock of only one respondent. Six respondents have jailbroken iPhones and actually have five apps in their Dock. I'm jealous—that's handy. Eleven people play a particular game often enough that they stick it in the Dock for quicker access. Three people check the weather frequently enough that a weather app has earned a piece of prime Dock real estate. Several developers of iPhone apps saw our survey/giveaway as an opportunity to hock their wares, either directly or by encouraging their customers to participate. Ten of the 22 people with Twitterrific in the Dock misspelled Twitterrific. You can follow @macworld on Twitter to participate in the other surveys this week; just respond to our morning question each day. We’ll randomly pick another (US-resident) respondent each day to receive a case. Oh, and in case you’re wondering, I have Phone, Mail, Twitterrific, and NetNewsWire in my Dock (shown at right). Although Things is fighting hard to take over one of those spots.